Turkish Prime Minister Ahmet Davutoglu said he'd "buy 10 riot trucks for each one burned down," while raging about property damage wrought by protests. Apparently investors took his word for it. The Daily Star says "at least 34 people were killed and 360 wounded, including police, earlier this month when Kurds took to streets over Turkey's lack of support for the mainly-Kurdish Syrian border town of Kobane, which is under attack from ISIS." In response, Turkey's Justice & Development Party has pitched a Homeland Security Reform Bill that Deputy Prime Minister Bulent Arinc said would "give the upper hand to the police" amidst "widespread violence" and "more space to resort to new tools and measures." 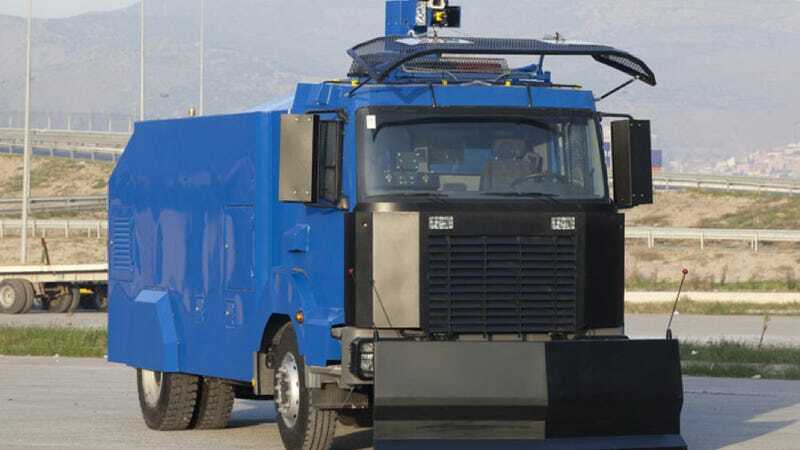 Sounds a little ominous from over here, but the folks who build TOMAs; Turkish acronym for armored water-cannon trucks and the country's riot-control rig of choice, are rubbing their palms together. According to Bloomberg, Turkish armored vehicle outfit Katmerciler saw a 5.2 percent boost in stock immediately following the Prime Minister's comments. It's reported as the biggest bump the company has had in months. Alper Ustunisik, an analyst at Yatirim Finansman Securities in Istanbul added; "Unless there are concrete steps to buy more riot trucks, this rise will be short-lived." Well, that makes sense. A lot of folks seem to be hoping those concrete steps never materialize. Turkey's "heavy-handed" police tactics have led to further unrest and tragedy in the past.